Everest Base Camp Trek is one of the most pupular trekking in the world. Trekking to Everest base camp is an adventure of a lifetime. Trip Distance: Approximately 130 km trekking + Hiking. Each day you need to trek + hike min 5hrs max 10 hrs. Depends on your fitness level, altitude and trek length. If you get Acute Mount Sickness or suffer short of breath due to lack of oxygen at high altitude we will not allow you to continue the trek. But If you insist to continue then you have to risk by your own. 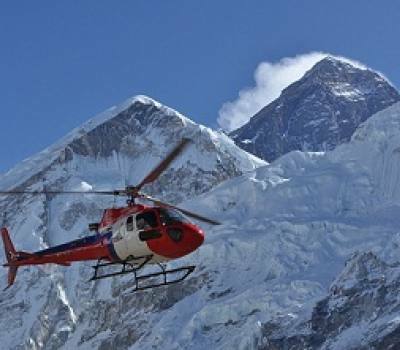 There are many trekkers encountered serious AMS and had to pay alot for helicopter rescue. Obviously there is no other way to rescue you at Everest Region if you're totally damage. AMS can kill anyone with short notice period if not prevented earlier no matter how fit you are mentally and physically. We will check your health conditions on daily basis such as heart beat, oxigent, pulse, and other vital routine check-up to ensure you are healthy, active and fit. So this offer only for adventure lovers. Gorgous views of Mt. Everest (8,848m / 29, 028ft), Mt. Lhotse (8,516 m-24,940 ft), Mt. Nuptse (7,855m-25,772 ft), Amadablam (6,812 m / 22,480 ft) Kangtenga (6,782 m / 22, 380 ft) Tharmarserku ( 6,623 m / 21, 855 ft) Kwangde (6,011 m / 19,837 ft) Kusum Khanguru (6,373 m / 21,030 ft) Mt. Khumbi-la (5,761 m / 19,012 ft). Keep in touch with us you are seriously, dedicated, mentally unbreakable, highly motivated, discipline, and been doing regular trekking & hiking training. Booking Conditions: US$ 350 per person Deposit Required with passport copy details. Note: Physical Fitness is required for this trekking. Only serious trekkers or hikers contact us. Rescue arrangements in case emergency only. Which is not mentions in Cost Included Section. How’s the food going to be on the trek? What are the symptoms of AMS ? What happen if i suffer from AMS? What do you mean Altitude sickness?